How to add UserControl inside Tab from code behind? You can create a Tab control with UserControl in ContentSection and add Tab items from code behind. This helps you to load content with multiple controls inside a tab and provides you a clear structured code. In order to add the web user control with the user defined structure with multiple controls and elements to a Tab, you can use the LoadControl() method of ASP UserControl class in code behind. Refer to the following steps to create a Tab items from code behind and map user control from code behind. Create a Tab element in the ASPX page and required UserControl pages for your application. Create an instance for UserControl and pass the virtual path to the LoadControl() method. Declare a Syncfusion TabItem instance and define its ID and Text. 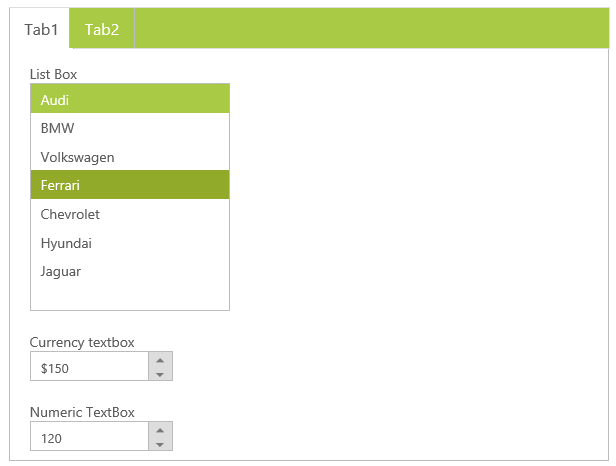 Finally, add the tab items to the Tab by using Items.Add() method. Refer to the following code examples to add UserControl from code behind. The following screenshot displays the Tab with the loaded user control and items created from code behind.